Premium Compatible Label Tapes for the Brother P-Touch H75 printer. 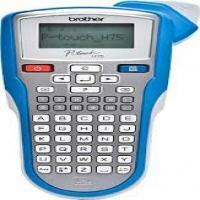 Brother P-Touch H75 is a handheld labelling machine fit for both home and office users. The device is highly portable and lightweight.It measures 107.4mm (W) x 202.6mm (D) x 56.6mm (H) in dimensions and weighs 365 grams. This makes it easy to hold and use. It supports variety of labelling for filing systems, CD/DVD cases, cables, shelf tags, name badges and switches. It also works fine in food packaging and craft work. Also, it provide built-in frame and symbols. All this together makes the device more appealing. The machine has LCD display which is easy to read. However, the display is text based and does not support any design feature. It has ABC keyboard which is flexible and easy to use if you are habitual towards it. The device supports 18 types of languages. It runs with a print speed of 10mm per second and is capable of repeating same label printing for 9 times. One add on feature is that mirror printing is available. The labelmaker comes along with a tape cassette with 4 metres of Brother P-Touch H75 Label Tape which is of TZE type. The tape cassette offers an iron-on feature that allows you to print the tape and iron it onto a uniform or sports clothing. Additionally, it includes six AAA alkaline batteries that provide convenience and portability. A built-in cutter makes sure that the labels are printed at the correct length so that you can organise your things with professional looking labels. The device prints out labels that are durable and tough. Built-in cutter, frames and symbols allow to customise the labels as per your requirements. Plus, a wide range of Brother P-Touch H75 label tapes are supported. All these features considered together make the Brother P-Touch H75 label maker highly affordable for home as well as office users. Q. Why doesn't my machine turn on when the Power key is pressed? A. The machine does not turn ‘ON’ even when the power key is pressed. For this, make sure that the batteries are inserted with their positive and negative poles pointing in the correct direction. Even if the problem is not resolved then the batteries may be running low. Replace the batteries with six new AAA (LR03) alkaline batteries. Q. I ordered the wrong Brother P-Touch H75 Label Tapes. I wish to return them. What is the policy? A. If you wish to return non-faulty tapes in case you have ordered the incorrect ones, please contact us within 30 days of purchase. The Brother P-Touch H75 Label Tapes must be returned unused, in their original undamaged packaging and in a re-saleable condition. We'll exchange the tape or give you a refund by placing a credit on your account. All such returns are subject to a 10% restocking charge. Q. Why does the power turn off at the time of pressing the print key. Why so? A. The most probable reason of this problem is that the batteries are running low. Replace these batteries with six new AAA (LR03) alkaline batteries of the same type. Q. The ink ribbon got caught in between the Brother P-Touch H75 Label Tape layers and came out of the machine. What should I do to resolve the issue? Make sure to wind the toothed wheel in the correct direction. If the ink ribbon has become separated, you cannot reel the ink ribbon. If the problem was not resolved, replace it with a new tape cassette. Q. What is the discount offered on the purchase of Brother P-Touch H75 Label Tapes? A. There is a discount of 5% offered if you are purchasing the label tapes for the first time. The discount is also given through promo codes. Other than this, if you purchase the label tapes in bulk, then the cost of the tapes is reduced. But there is no discount on a regular basis. Q. Why do my labels have a blank horizontal line running through the text of the label? Press the power button to turn off the machine’s power. Disconnect the AC adapter. Now open the back cover. Remove the tape cassette and the batteries. Clean the print head using a dry cotton swab to gently wipe up and down along the print head. Q. If stripes appear on my label. What is the problem? A. If stripes appear on the label, it means you have reached the end of the Brother P-Touch H75 Label Tape. Replace the tape cassette with a new one. Q. How do I reset the P-touch back to its default factory settings? Now hold down the ‘F’ and ‘R’ key. Press power to turn the P-touch back on. Now release the ‘F’ and ‘R’ key. The machine has been initialised. Q. What are the key features of the Brother P-Touch H75 Label Writer? A. The key features of the label printer are that it is portable and lightweight. It has a real time clock to quickly add the current time or date on the labels. It has built-in frames and and symbols. It includes Brother P-Touch H75 Label Tape cassette. It prints 3.5mm, 6mm, 9mm and 12mm width labels.